President Donald Trump has escalated his highly unusual attack on the Federal Reserve. He tweeted early Friday that higher interest rates are taking away America's competitive edge with China. On Thursday, he complained that higher rates were undoing his administration's efforts to help the economy. The dollar fell on Trump's tweets. The Federal Reserve was constructed early in the 20th century to be an independent financial institution, free from the whims of politics. The Fed has been carefully and gradually raising rates over the past several years to keep inflation in check and to prevent the economy from overheating. Higher rates strengthen the dollar against the world's currencies, which makes the United States a more expensive place to invest. Trump said that raising American interest rates makes China a more attractive to place to invest, because China artificially devalues its currency. When US rates go up, American businesses' dollars go further outside the United States — particularly in China, where the yuan is cheap. Ironically, the Trump administration's trade war with China has helped devalue the yuan, which has fallen more than 8% over the past three months. China's slowing economy has pushed the yuan lower, too. The yuan fell sharply against the dollar on Thursday and Friday after China's central bank indicated that it was willing to accept a weaker currency. The People's Bank of China does not let the yuan float freely like the dollar. Instead, China sets a daily trading range for the yuan — an action that Trump and other China critics have described as currency manipulation. A weak yuan could help China's economy cope with American tariffs, because Chinese products would be cheaper for buyers who pay in dollars. 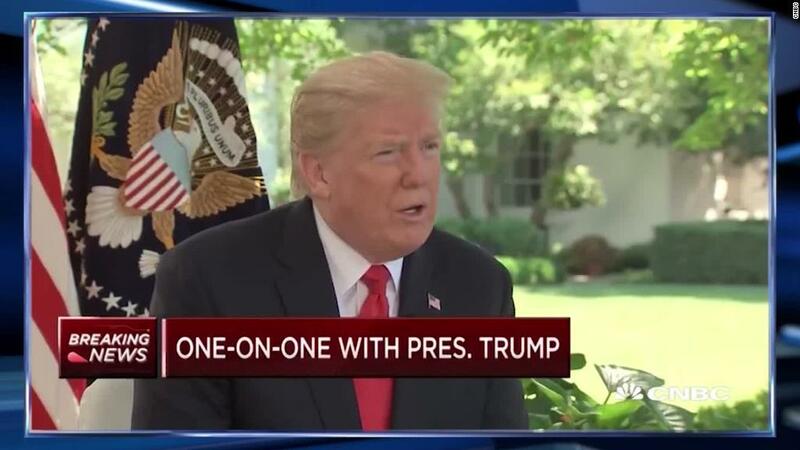 In an interview with CNBC on Friday, Trump reiterated that he is willing to impose tariffs on all $506 billion worth of goods that China exports to the United States. The United States is preparing to impose tariffs on another $16 billion of Chinese exports on top of the $34 billion already subject to American import taxes. Meanwhile, other currencies have lost ground to the dollar this year. The European economy has lagged the United States', and the European Central Bank has only just begun to tighten its monetary policy. Trump has spoken out about the dollar and interest rates before. His comments are not only inconsistent with precedent, they are also inconsistent, period. He has supported a strong dollar in the past. "The dollar is going to get stronger and stronger, and ultimately I want to see a strong dollar," Trump said in a January 25 interview with CNBC at the World Economic Forum in Davos, Switzerland. He also previously supported higher interest rates. He criticized former Fed Chair Janet Yellen, saying she should be "ashamed of herself" for keeping interest rates so low. "The ones who did it right — they saved their money [and] they cut down on their mortgages ... and now they're practically getting zero interest on the money. Those people have really been, you could almost say discriminated against," he said in a September 12, 2016, interview with CNBC. This is why presidents are not supposed to weigh in on Fed policy. What's politically expedient at the time may not be good for the American economy in the long run. Larry Summers, who led the Treasury Department under President Bill Clinton and served as President Barack Obama's top economic adviser, told CNNMoney that "nothing of this kind has happened in the past 25 years." One concern, he said, is that the Fed will now be reluctant to slow the pace of rate hikes, even if it believes it's the best course of action. "It will look like it is responding to political pressure," he said. The other risk, Summers said, is that people will believe US monetary policy is politicized. This could undermine confidence in the long run of the economy, causing bond prices and stock prices to fall. "I would think anyone at the Fed would have to be sorry that this kind of inappropriate intervention took place," Summers said. The Fed had no comment on Trump's remarks. Chairman Jerome Powell has played down concerns about Trump's politicizing the Fed. "We have a long tradition here of conducting policy in a particular way, and that way is independent of all political concerns," he said in a radio interview last week with "Marketplace." St. Louis Fed President James Bullard told reporters Friday that Trump's comments would not influence the central bank's decisions. "Lots of politicians talk about Fed policy. The president does not have to stay out [of the debate]," he said. "It doesn't really change what the committee faces."